1-to-1 lessons can make the German grammar become far more accessible, because you can ask everything you've ever wanted to know and discuss it with me in English. So if the direct method, used in most language schools in Vienna, doesn't work for you and learning in a group with 8-10 other students doesn't fit your needs, then probably you should try a couple of private lessons. Especially in the beginning it's advisable to go through the German grammar in English, by the way of translating -> comparing -> explaining. Private lessons have the advantage to learn individually and at your own pace. Together we'll sharpen your passive skills in reading and listening, and practice your active skills in speaking and writing. 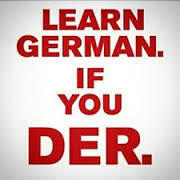 I'll make sure you understand grammar, enhance your communication skills and build your confidence in speaking German. Additionally to grammar, which I really like to teach and can show you how it works, my classes focus on spoken communication: Vocabulary and pronunciation training, everyday conversation and small talk. Whether you're new to German or looking to fine tune what you already know, we’ll make your German course to suit your needs. The lessons are hands-on and practical, I don’t use mass market course books, but hand-picked books and my knowledge based on my solid experience in teaching and translating. I aim to create personalised courses which specifically address your level, your goals and your schedule. Enjoy the flexibility and personal attention of a 1-to-1 course in our home-office in Vienna City Center or in your company offices. Learning German 1-to-1 offers benefits to both teacher and student alike. As your private teacher I can costumize your lessons to your preferences, whether you'd like to have a brush-up course, an exam preparation, a grammar course or 'just conversation'. You can also tell me when you prefer a certain method or a specific book, which skills you want to practice most (listening, speaking, reading or writing) and on what area you'd like to focus, e.g. vocabulary, grammar, conversation and everyday Austrian, working with texts for your job or the university, technical language or any other special field etc. For your orientation: Beginners need usually 30-40 lessons to acquire a basic knowledge of the language, e.g. level A2 of the Common European Framework of Reference for Languages, and it will take approx. another 30-40 lessons to reach the intermediate level B1. Here you can find a compilation of German online resources with lots of interesting and helpful links to aid you to learn German on your own. German Conversation Training is for you if your spoken German needs polishing and if you want to get (more) comfortable in conversation. In addition to standard German classes I also offer conversation lessons with focus on spoken language to help you gain more confidence in speaking if you're not used to talk in German. Private conversation training is highly interactive with about 50% of learner participation, since you are the only one learner, so you'll speak a lot based on question-answer-sequences and eventually be able to automatize sentence structures and word order. We'll build up an individual vocabulary for you and you'll practice it without pressure in a relaxed athmosphere. That way youl'll experience success in speaking German and become gradually a confident speaker. We can also discuss your questions about living in Vienna and chat about the Viennese, the tasks and everyday challenges after relocating, different work environment and culture, how to fit in, dealing with homesickness, feelings of culture shock, intercultural partnerships, the curiosities of day-to-day life in Austria, or any other topic you'd want to. I'll help you to find your 'German voice' and use your knowledge actively. Preparation for the Austrian Citizenship Test: The Austrian Citizenship Act outlines that persons who want to become Austrian citizens have to meet certain standard requirements such as German language skills at B1 level of the Common European Framework of Reference for Languages, as well as the basic knowledge of the democratic system and the fundamental principles deriving therefrom, plus the history of Austria and the province where the applicant has her/his primary residence, such as: 1.) Geschichte Österreichs 2.) Demokratische Grundordnung und 3.) Geschichte meines Bundeslandes / Landesgeschichte Wien. Together we can go through all these brochures, or if you prefer only through the exam questions, which we translate and discuss elaborately. Afterwards we'll make several mock exams with evaluation of the test results, so that you know exactly which topics you need to practice. I'm a highly qualified and experienced translator and a language teacher for German and Hungarian. I have taught both in the private sector and in numerous language schools, adults and children of different ages. I can offer Hungarian to university level, for this is my mother-tounge, and German to B1 level since I live and work in Vienna for more than 15 years now. I came here to study and made my Bachelor degree in Transcultural Communication and a Master degree in Translation and Terminology Sciences at the University of Vienna, then settled down with a good man and built a family. I also have a teaching qualification for 'German as a Foreign Language' from the University of Kassel in Germany, and a didactic training on the renowned BERLITZ-method for 'Native Speaker Language Teachers'. Usually I work from home, where I have a vast library of teaching resources such as worksheets, textbooks, picture dictionaries, flash-cards, games and lots of books for Beginners with German-English parllel texts, short stories for Easy Readers etc. Since no two learners are alike, I use varying tutoring approaches, whereby enjoyment is an important factor in my lessons. I very much like to use language games, cards, songs, short stories, videos and the internet to teach my languages, for I do believe that learning German, as well as Hungarian, can be fun. I aim to foster a friendly but professional relationship with each of my students, to build their confidence and self belief when they learn a new language. German can be an extremely challenging language and as an experienced German tutor I really can help you learning it. I'll patiently work alongside you at the speed that works for you best. In the first lesson we'll analyse your needs, noting your strengths and weaknesses. My German lessons involve paying particular attention to everyday vocabulary, focusing on the most important grammar topics, providing good practice in colloquial Austrian. If you need help with any particular area of difficulty, we can target them of course and practice specific skills and speacialized vocabulary of your choice. Organization: The German lessons can be 60, 90 or 120 minutes in length according to your preferences and your schedule. You can also bring your colleague, friend or spouse and take semi-private lessons; we have enough place for as many as 3 persons in our home-office. We live in the city center of Vienna, just beside the famous Karmelitermarkt in the 2nd district; our appartement is easy to reach with U2, U4 and U1, tram 1 and 2, and the bus lines 5A and 5B. Home tutoring at your place or in-house trainings at your company are also possible by agreement, please ask for an individual price offer. Even though we can arrange your lessons at short notice, I usually require 3-4 days in advance to book your lesson at your preferred time. How to cancel a lesson: If you can't attend the lesson, I need you to cancel our appointment in time and give me notice 24 hours in advance, but at least on the day before our appointment by no later than 18:00 by phone, e-mail or per SMS. Otherwise I'll have to charge 100% of the lesson fee, since I reserved that time slot for you and can not rearrange my day on such a short notice. Thank you.